Join the discussion on our forums! 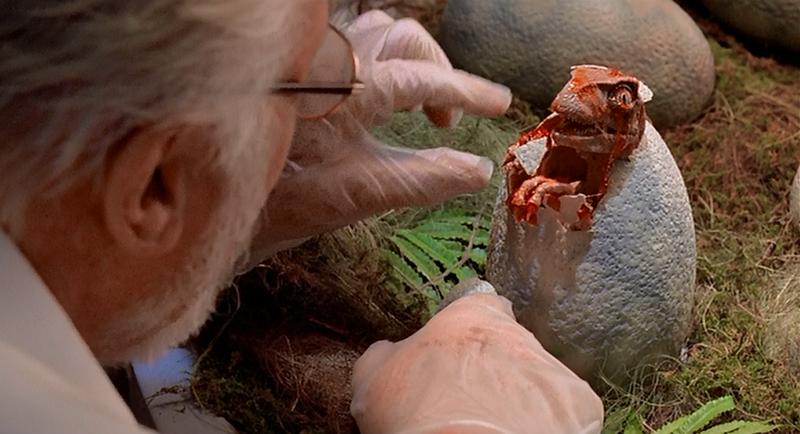 Come discuss Devilsaur Egg over in our dedicated Devilsaur Egg discussion topic. Deathrattle: Summon a 5/5 Devilsaur. A key ingredient in all discerning Funnel Cake recipes. Most annoying card in the game. I really wish this had the beast tag, ditto for the dragon eggs. Looking at how things are going, I just can't wait for the Infernal Egg, a 4 mana 0/4 that has Deathrattle: Summon a 6/6 Infernal! This is really fun in a hunter deck, combined with play dead, terrorscale stalker and stitched tracker. It is difficult for most of the control decks to deal with and has enough tempo against aggro on a good draw. Great when priest / secret mage / warlock try to board clear and more pop up. I think this card might do well with the Druid's Mark of the Wild card as it forces the opponent to trigger its deathrattle effect while losing some of their minions/minion's health or waste one of their spells. But for me being a paladin main I'd say this card is absolutely perfect for paladins as they can buff the card to help trigger the deathrattle effect and to help control the board in the early game thanks to the Devilsaur's low cost and having Blessing of Might on hand can help extremely well in the early game. Zoo player like me must be jumping of joy for this card, plus Zoolock gets other buff in Wild. This card + Mirage Caller creates insane value for the mana. This is insane for paladin. New picture makes Tinkmaster Overspark sad. 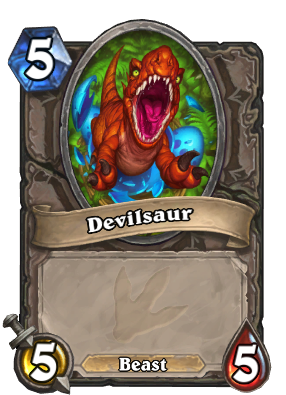 Devilsaur was his pride - why not reuse the picture? Taunt counts as an immediate effect. 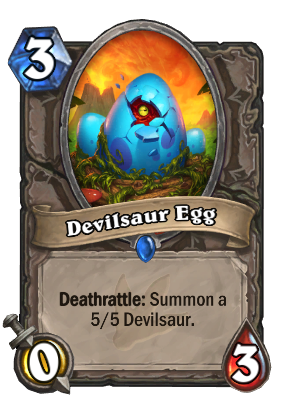 Not the exact stats and all, but a lot of people called that there would be an egg in this expansion.